March 25, 2011 - Garmin has raised the bar with the announcement of the GTN 650 and GTN 750 series. These panel-mount units are certified and approved for installation in hundreds of makes and models of general aviation aircraft. The GTN 650 and GTN 750 feature new capabilities for GPS/NAV/COM systems like touchscreen operation, graphical flight planning with victor airways and high-altitude jet routes, remote transponder, remote audio control (750 series only), SafeTaxi and electronic chart capabilities (750 series only). “As the successors to the very popular GNS 430W and 530W, the GTN 650 and 750 have big shoes to fill. We’re confident that the GTN series will set a new standard on what avionics for general aviation aircraft should be, just as the GNS 430 and 530 did when they were announced in 1998,” said Gary Kelley, Garmin’s vice president of marketing. The most notable physical difference between the GTN 650 and 750 is the screen size. The GTN 650 has the same exterior footprint as the GNS 430W, but has a 4.9-inch screen (diagonal) that has 53 percent more screen area than the GNS 430W. 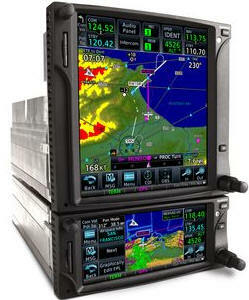 The GTN 750’s large 6.9-inch screen (diagonal) has 98 percent more screen area than the GNS 530W, which makes it possible to view an entire chart via Garmin FliteCharts and ChartView, as well as display integrated audio and intercom functions (with the new optional GMA 35 remote mount audio processor). In addition, both units display a greatly enhanced, higher resolution picture (GTN 650: 600x266 pixels; GTN 750: 600x708 pixel) that has over 5 times more pixels than the GNS 430W and 530W, respectively. The touchscreen GTN 650 and 750 both feature a shallow menu structure, desktop-like menu interface with intuitive icons, audio and visual feedback, and animation so that pilots know exactly how the systems are responding to their input. The GTN has a touchscreen alphanumeric keyboard, and also utilizes a “back” icon for quick and easy operation. Recognizing that hand stabilization will help make it even easier to enter data, both units have a finger anchoring bezel around the side of the display and fingerboard at the bottom of the screen. For those who prefer traditional data entry via buttons and knobs, the GTN systems have a dual concentric knob for data entry, volume/squelch knob, “home” button and “direct to” button so that pilots can do all the basic fundamentals – like establish a route and change COM frequencies – without using the touchscreen. With the home key, pilots are seldom more than two taps away from all primary pages and functions. Flight planning made easy, the GTN series offers graphical flight planning capability (patent pending) so that pilots can edit an active flight plan route on the map and easily enter a new waypoint or modify the sequence by tapping or dragging their finger on the screen. Victor airways and high-altitude jet routes can be overlaid on the moving map, and airway segments can be selected onscreen for instant entry into a flight plan. The system has a unique “rubber band” feature that lets pilots select a flight plan leg on the screen and then alter it to accommodate a deviation or ATC amendment. In addition, pilots can pan across the map display by swiping their finger across the screen. Enhanced situational awareness, thanks to built-in terrain, mapping and obstacle databases, the GTN provides a greatly enhanced, high resolution presentation of the surrounding area. A built-in terrain elevation database shows color-coded alerts when potential terrain conflicts are ahead. Full Class B TAWS alerting is also available as an option. The SBAS/WAAS equipped GTN 650 and 750 let pilots fly GPS-guided LPV glidepath approaches down to ILS-comparable minimums. In addition, precise course deviation and roll steering outputs can be coupled to select autopilots so that IFR flight procedures may be flown automatically. Add weather, traffic and more because the GTN offers a wide array of compatibility with select Garmin avionics and sensors, Garmin has made it possible to have a consistent and intuitive interface to other systems – like audio and transponder – by creating simplified systems management functionality on the GTN flightdeck. Saving valuable panel space, Garmin’s new GMA 35 remote mount audio processor (optional) interfaces with the GTN 750 and makes it possible for the GTN to be used as a touchscreen control head for the aircraft’s audio and intercom functions. The GMA 35 helps streamline cockpit communications with record/playback capability for copying clearances. It also includes an internal microphone that senses the amount of ambient noise and automatically adjusts the cockpit speaker and the headset volume based on the level of noise in the cockpit. Garmin’s GTX 32/33/33D remote transponders (optional) also interface with the GTN 650 or 750 so that pilots can control transponder function from the GTN’s display. Optional versions of the GTX 33/33D mode S transponders are available which support ADS-B/Out. Optional XM WX Satellite Weather™, lightning, and traffic system inputs are also supported and may be overlaid on the moving map. In addition, XM radio is available as an option (XM WX Satellite Weather™ and radio service is only available to U.S. and Canadian customers with a subscription and with an optional GDL 69 series datalink receiver). The standard GTN 650 and GTN 750 feature a 10-watt COM, and a field upgradeable 16-watt version is also available. In third quarter 2011, Garmin will make available a GTN 725, which is similar to the GTN 750, and is a GPS only unit. Also, a GTN 625 will be available that is a GPS only unit, and a GTN 635 that is a GPS unit with VHF Communications radio. All units are SBAS/WAAS enabled. The GTN 650 and GTN 750 received FAA TSO authorization in March and are STC approved on a broad model list covering most Part 23 fixed wing aircraft. The first units are now shipping and will be on display at the Sun ‘n Fun Fly-in, March 29 to April 3, 2011. The GTN 650 is expected to be available at a suggested retail price of $11,495 and the GTN 750 is expected to be available at a suggested retail price of $16,995. The GMA 35 remote audio processor is expected to be available at a suggested retail price of $2,995.